There are many reasons why you choose a book. 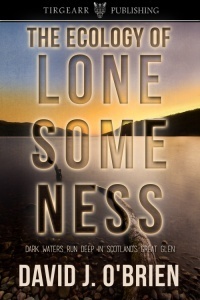 I chose The Ecology of Lonesomeness because Mr O’Brien has a degree in environmental biology and a doctorate in zoology. I didn’t go to university because I didn’t know what to study but in the last few years I decided that this is what I would have read, had I gone. This book tells the story of Kaleb, an American ecologist, who arrives in the Great Glen to study the ecology of Loch Ness on a two-year grant. He meets Jessie, a local girl, recently returned from university and they fall in love.